Point chompers make your table settings look so cute it’s scary. 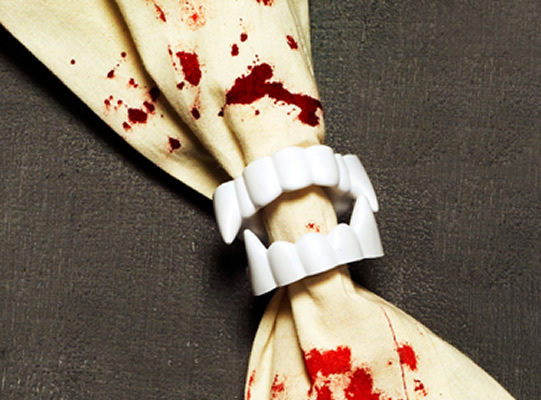 Sprinkle white cloth napkins with red Kool-Aid, thread a white twist tie through a set of plastic vampire teeth, and finally secure a twist tie around the center of your napkin. 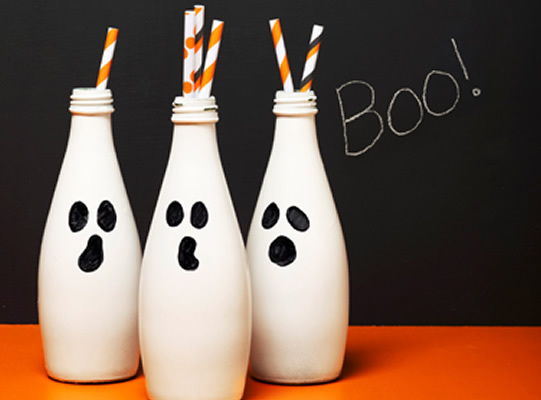 Raid your recycling bin to make these glass ghosts in four easy steps: First, remove labels and caps from bottles (we used Perrier ones here). Spray-paint them white, then draw faces on with black marker. Finally, throw in colorful straws for cute centerpieces. 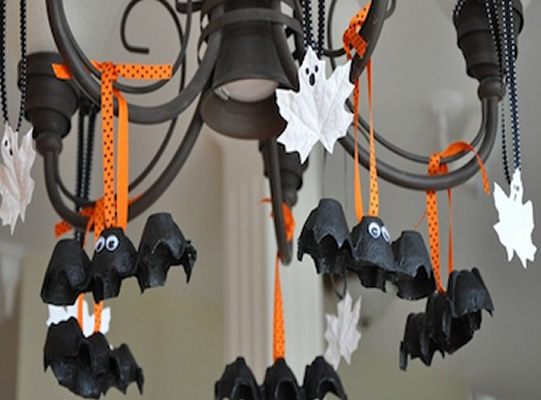 Kids can help turn egg cartons into bat decorations; just cut, paint, and add googly eyes. Make cute, cheap Halloween ghosts by painting leaves white, then drawing a spooky face with a marker. Heath Refinishing is fantastic! We gave Steven about eight pieces of furniture to repair/refinish and he did a spectacular job at a good pace and for a very reasonable price. Some of the furniture is around 40 years old and was very damaged by myself and brother when we were children. I was very impressed by the furniture when we got it back, they looked as though they were brand new! He also repaired and refinished a rocking chair that my mother used when we were children. All in all a wonderful job! I highly recommend Heath for any repair or refinishing and would recommend Heath to friends and family.